Opening ceremony and emotional speak of the man. All kind of disciplines and many, many categories. National woman boxing championships 2009, Croatia. Same as Silvia La Notte also Marina Horvat is very active in AIBA - english boxing. When you read savate history and all that hate and rivalship beetwen english and french version from the times of Carpentier (who was stollen by English boxing) you get that funny feeling that some group of people on international level all the history try to present us some weird pictures of reality that never exists. There are always enemies, people in confrontation, indians and cowboys, good cops and bad cops but at the end this only group always collect all the money. Always. And control everything. And this is the point of all this story. Is this really Croatian boxer - Hrvoje Kisicek in Spanish integral dress? Savate PRO is open to everybody - exept savateurs who sistematicaly wants to progress from the beggining. AIBA, WAKO, IFMA, IWUF and FIS is just one big friendly family - except people who really love and really invest and specialize savate. The same words used Croatian boxer Mate Pralov (RIP) who said - yes I am Amateur boxing world champion but only half of champion, because there is also another organisation. Shock your brains, soul and mind. Who helped Muay thai to grow in USA and Europe? Kickboxing? Kickboxers? These days we see very similar sports Thai boxing amd Muay thai. Look at this "well known" intro campaign. The same principles were used at the times of karate, judo, ju-jitsu when small Japanese masters won small circus tournaments against wrestlers and boxers during last century. When somebody from Verona asks why their "figting" is not savate, when you observe and comment their kickboxing in shoes the answer is very easy. As we know in Italian region Veneto - there is just FIKB - kickboxing, and in Friuli some kind of MMA and Penchak Silat with Marko Brondani. 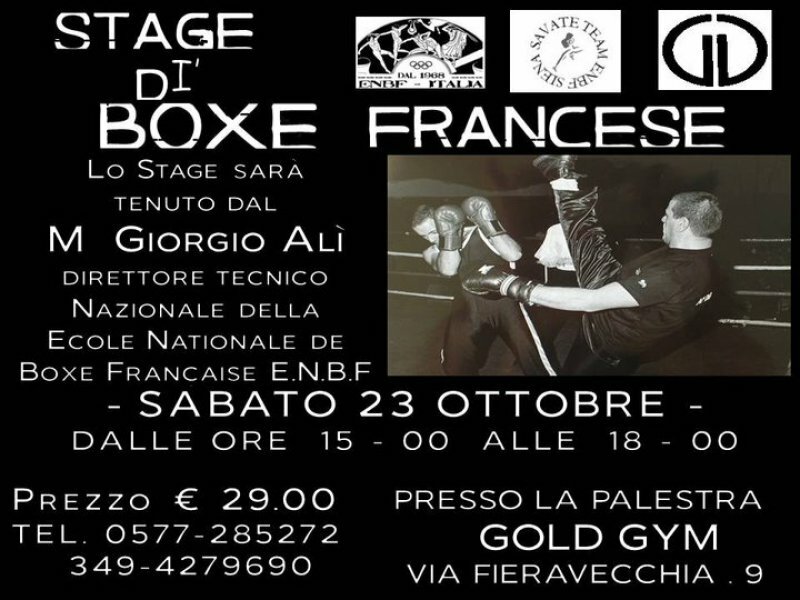 Maybe that kind of savate exist in FIKB - Italian kickboxing federation, but we all know that FISa and FIKB are separated and also savate is not kickboxing? 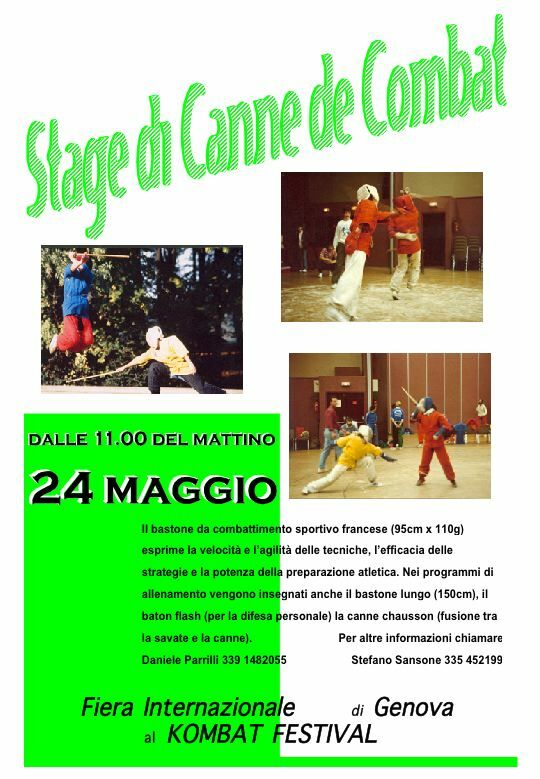 But to be real Italian savate club - the best way is to join FISa and to start also with canne de combat and assaut as parts of savate - the whole sport. Muay thai fighter from France was defeated with savate tactique and strategy against Thai - Muay thai Fighter. Strange this world is. 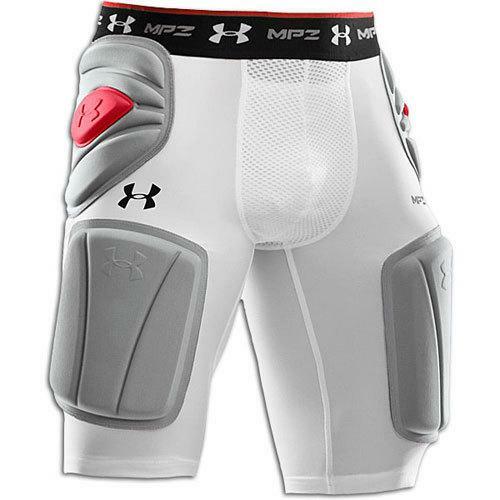 You know why are they afraid of assaut? Because kickboxers don't know nothing about savate technique. They would be disqualified in the first seconds of every assaut fight because of the "NON SAVATE TECHNIQUE". But there is another posibility. You go to combat where nobody except French team knows nothing about savate and in this way you compete in the same kickboxing brotherhood. There is no technique, no strategy it is just that "Tough Guy" expression on your face. So typical for a Balcane region nations. Is Alexandre Walnier leaving savate because of his major FENCING activities FIE? Spain and Belgium organised junior and cadets world championship 1997 on Tenerife islands. 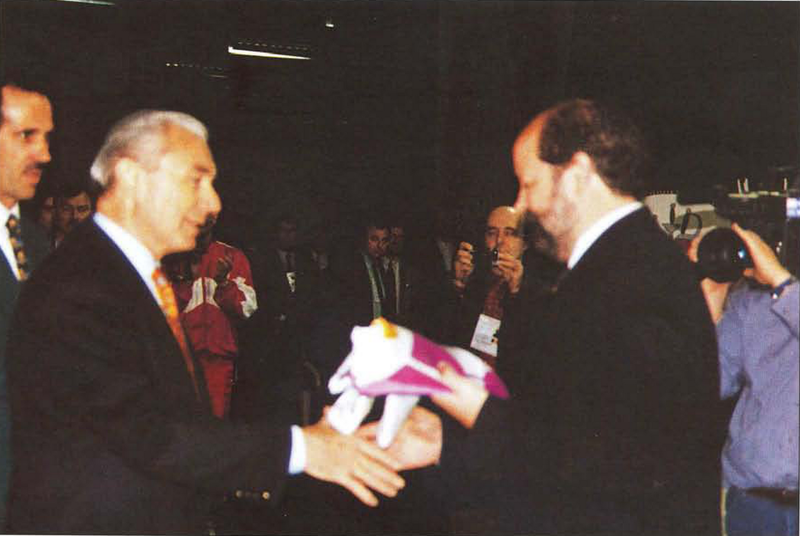 On a picture - 1997 - president of Belgium fencing federation Mr. Alexandre Walnier, Rene Roch and Angelo Martinez Vassallo - trainer of Spain fencing. One life in most cases is not enough to fly on two planes at the same time unless if you are 007. James. James Bond. After several months Italian student sport called CUSI still blocks information about the first SAVATE University world championship 2010. Check it for yourself. Isn't this very complex international game? Probably there will be some letter adressed to FISU about well known LATIN games. Let the play goes on. TV - FR3 Bourgogne - 1st Open International Savate Pro tournamentle 23th of October 2010 in Chevigny Saint Sauveur. 8 Elite fights. Many similarities with the ussual combat fights. If this discipline will remove all kickboxer, muay thai, kung-fu and boxing fighters from combat regular competitions we will say thank you Savate pro. In all other cases we would say just - nothing new. Fast and furious 2 tournament mix of everything and also savate. 25th of September: World savate 2010 chmapion Mathieu Stehlin gym professor of EPS school Simon Bolivar. Very nice savate class for children. This type of savate teachers are more important for our sport than 10 super - pro - combat fighters. It is just the decision of those who really specialize savate as the whole sport. I think in the near future FISav combat finals will have serious problems with multisport events where kickboxing, K1, MMA, Muay thai and other talents show also their muscles. WADA regulations will be the main problem. Amateur or professional? What kind of competition? How can WADA accuse organiser if the MMA or muay thai competitor is doping positive on SAVATE finals competition? Who will be responsible? If the logo below is WAKO, FIKB, FISav, FPI (Italian boxing federation)... ? KICKBOXING SUPERSTAR! Milano, Saturday 23th of October - Palaiseo. 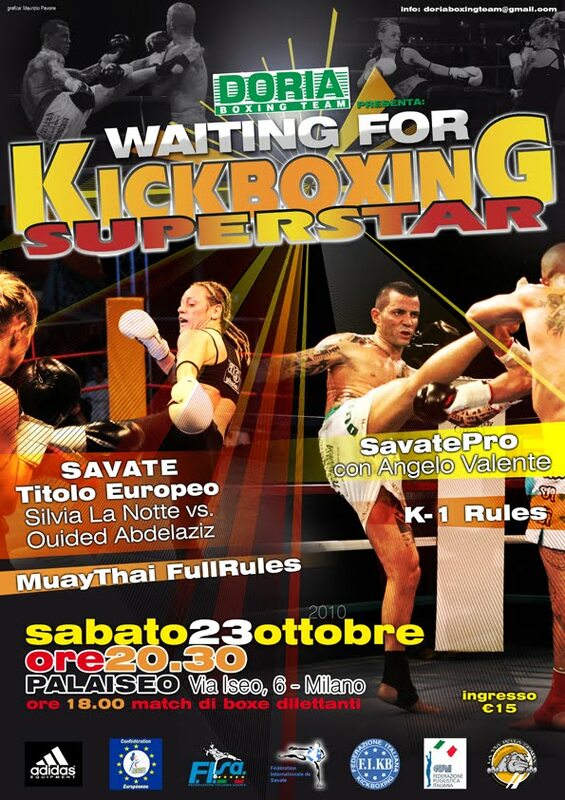 KICKBOXING SUPERSTAR - Lino Guaglianone - DORIA BOXING TEAM organise this mixed International event of Savate Pro, K-1 rules, Kick Boxing, Muay Thai. Italian way. Palaiseo - Palalido di Milano 18.00. Angelo did not fight in savate for the last 10 years but the new formula of SAVATE PRO made him to put on savate shoes and fight this weird new savate discipline. DON'T FORGET - ITALIAN KICKBOXING FEDERATION IS JUST A PART OF ITALIAN BOXING FEDERATION - LET'S SAY EXPERIMENTAL FEDERATION. AND DORIA BOXING IS JUST PUGILISTIC AND OF COURSE BOXING ACTIVITY. ISN'T IT WEIRD THAT ENGLISH BOXING PREPARES FINALS FOR THE FRENCH BOXING CALLED ALSO SAVATE? And Alfredo Lallo as speaker on WKN tournament. President of FISA - Italian savate federation. Sportaccord website with SAVATE !!!!!!!!! 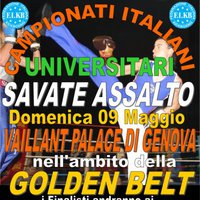 Who said that Italians didn't have elimination fights before the World university savate championship 2010? 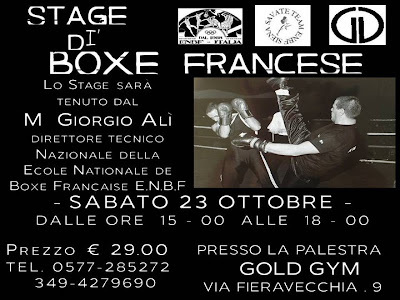 23rd of October in Italy, the promotor of savate sport in Italy E.B.N.F. GIORGIO Ali will demonstrate all forbidden savate kicks as AXE kicks - see in this picture and explain to the audience how kickboxing technique can be superrior to savate technique. Is this ex-FIKB promotion of savate sport as Falsone talked his stories to FISav? 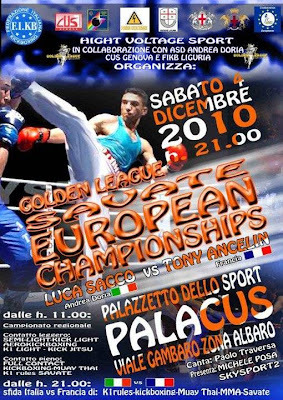 Italian Golden League - European savate championship 2010? In this year it was World assaut savate 2010 championship in Paris. LUCA SACCO ((Andrea DORIA - GENOA, Italy) trainer: Luigi ILENGO) vs. TONY ANCELIN (France). Strange. 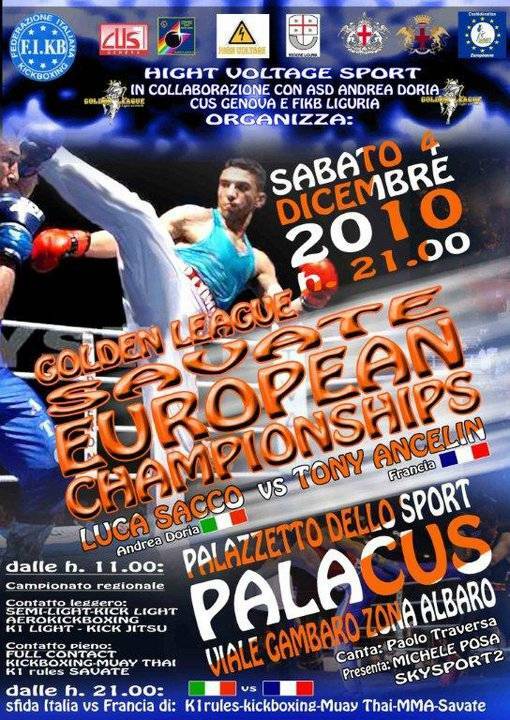 Probably it is combat fight for European mens title 2010. Palazzetto dello Sport PALACUS, GENOA in Viale Gambaro (zona ALBARO). On the 26th September 2010, I had the great honour of being elected as the first female President of the International Savate Federation. In recent years, I have worked closely with FISav staff and officers and have been able to observe the issues faced by the federation, the areas of work, the successes, and what works well and what does not. I believe it is necessary to have a period of consolidation for FISav itself, including updating our statutes and operating procedures, strengthening our member federations and our links with them, and making our organisation more transparent and accountable to its members. Our recent achievements - recognition by WADA/AMA, FISU and Sportaccord - bring with them increased expenditure. I propose a review of expenditure to identify efficiency savings and forecast expenditure for future years. Along with this, we need to increase our income, for example, by showing sponsors and partners (public and private) the benefits they can gain from working with us. We should also acknowledge the differing levels of financial support in our member countries, and look for positive ways to support those countries with the biggest need. National federations with a stable financial position should be identified as potential hosts for future championships, and be given a sufficient amount of time and support to gain sponsors. We must also make improvements in the collection of affiliation fees and give national federations clear benefits for paying on time. Currently the work load for FISav officers is very high. As an organisation, we need to strive for efficiency and provide an appropriate level of support through paid staff. We also need clarity in senior roles; the areas of responsibility for FISav officers and Commissions must be more accurately defined and published for all to see. This will also help with transparency of the organisation and representation. The method of operation of the continental confederations, their duties and rights should also be clear to all, and be discussed and approved by the FISav General Assembly. National federations should be able to identify a route to having their views heard and considered by the continental confederations and by FISav. FISav must consolidate the number of active federations and help them to become stronger, as well as develop ways of supporting new federations. Statutes, procedures, resources and training materials should be available in several languages. We have, within our membership, individuals who are willing to help with this; however, there are also documents which require professional translation. Our Championships are judged on the quality of the athletes, but also on the quality of the judge-referees. We need to improve the training of the judge-referees, provide them with feedback on their performance, and develop a FISav passport to record their activities. Their responsibilities are great: being protective of the health of the athletes, the respect of the rules and ethics of Savate, and being just in their decisions. Many of our members will know that Savate was a demonstration sport in the 2010 Sportaccord Combat Games in Beijing. I worked on this successful project with Gilles Le Duigou and Jean-Marie Rousseau, and was delighted to hear of the welcome and encouragement given to our delegation by the President of Sportaccord, Mr Hein Verbruggen. Our aim is for Savate to be a full participant in the next Combat Games in 2013. Looking ahead, we should not neglect opportunities to showcase our sports and increase participation, whether this be in the Mediterranean Games, the Masters Games, the Paralympic Games... Many of our national federations are in Commonwealth countries; their members would value the opportunity to take part in the Commonwealth Games. 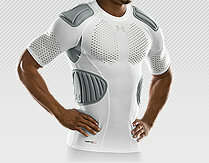 All of our work should benefit any future application to be accepted as an Olympic Sport. We should embed the Olympic ideals and ethics in all that we do. We should be a model for excellence, respect and friendship, encouraging fair-play, just decisions, and participation at all levels from the newest beginner to the elite athlete, from the trainee judge to the most senior Delegate Official, and from the club volunteer to the international management. 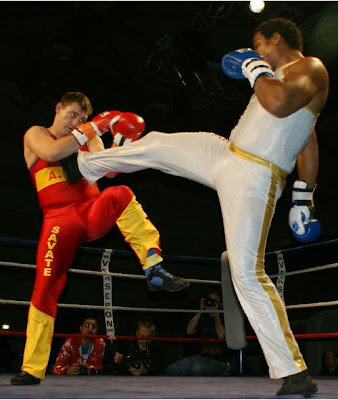 Over 40 countries were scheduled to participate in the 2010 Savate Assaut World Championships which were held in Paris, France on September 24 and 25. The United States represented with a small team of three fighters who qualified at the National Championships in New Hampshire in May. Of the three fighters, two hail from Chicago, as well as the United States Savate Federation President, Greg Znadja, who also attended. Mike Illic of Chicago made this his third trip fighting for the United States at Worlds, and Chicagoan Meredith Lyons fought for her second time on the world stage. Each fighter scored a win and both represented well. U.S. fighter Cindy Vander Schueren made her World Championship debut. "The United States should be very proud of the performances of our three fighters," said Znajda. "They represented the country well and look forward to the next competition." Federation president Znajda was pleased with the fighters' performances and hopes to continue to grow savate in the U.S. Both Chicago fighters expressed a desire to continue their training and increase their involvement with international competition. U.S. fighters made contact with the Canadian and Mexican federations at the event and hope to work together to grow the North American savate environment. "The U.S. Team performed excellently despite the overwhelming experiential deficits," Znajda said. "In Europe they can fight in savate every other week if they want to. In the United States a yearly fight is about the best you can do short of informal sparring sessions. Despite this discrepancy Meredith and Mike's movements, counters progressive attacking style and form were on par with all countries including France. What was lacking was timing and tactical expertise which can only come with more competitive ring time. This opinion is backed up by the closeness of the scores and the long deliberation times that were necessary to decide the winner." When asked if more opportunity for competition will be available for savate practitioners in the future, Znajda was positive in his response. "The USSF's plan is to increase local and regional interest by sponsoring competitions and seminars, attaching single fight competitions to other disciplined events and we are well underway in accomplishing that goal. The overall goal is to have a complete team to head to France for the next World Championships in two years." (But Croatian taekwondo WTF federation cooperate with Ung Chan group which wants to be inedependent of WTF , so they ask for Sportaccord recognition in 2010. Ussualy we know WTF and ITF merging activities through Jung Hwa group. Weird. We have returned from Korea exhausted and tired from a long jurney (around 12.000km), but alive and well, and with wonderful impressions and memories for a lifetime.I assume that everyone of us who has ever dealt with taekwon-do skills at least once wanted to see the homeland of taekwon-do and meet the culture, history and present of these distant lands and peoples. Dream I have dreamt together with my family and four of my students, but also friends, was just as beautiful as in dreams before coming to Korea, and perhaps even better. Courtesy and kindness of people, their sense of responsibility and honor, and dedication to this art entirely impressed me. I would like that this dream once more could happen. Unfortunately I could not share this dream with some nice people, my students that I wanted to be next to me and a lot of times I thought of them there.They all deserve to be with me there and be a part of everything up there these 10 days occurred. It was a privilege to share a gym and the arena, and thus compete with the best individuals and the best teams in the world. Even a defeat from such could not create a feeling of anger because you can not disrespect such opponents when you see their skill and that effort. Friendships that were created or restored from before are the invaluable gift and a privilege for those who were there .Common happy and sad moments from the competition, the joy of night life, sadness at parting on the last day, to change shirts in between have a wealth of memories that they will all remember for the whole life. To receive first gold as a coach and climbing of your student on the podium during the medal awarding is the valuable privilege and reward for all the effort of all those who in any way assisted in the realization of this dream and privilege. When you are on the highest pedestal, and beneath you are major countries like USA, England, Canada and Argentina, then you can not feel anything but pride and honor. The privilege of me as a coach is in the fact that I led a team of wonderful people who worthily presented themself, their country and their school, and me as a coach. Every each of them gave their maximum in their current knowledge, skills and willingness to be competitive in all disciplines they competed in. Sanda Livia Maduna, world champion in sparring, ranked fifth in the special techniques after losing the battle for the bronze medal from th competitor from England and Adam Filipovic, from an Argentinian with whom he celebrated the night before and looked forward to. To all of my other competitors, I would like to thank them for representing both them and me as a coach in a positive light and because they left a wonderful impression on others. Also for me was a privilege and an honor to be a father and coach and team leader, of World Champion Sanda Livia Maduna who was elected on behalf of the ITF competitors (700), together with a WTF competitor from Australia on behalf of a total of around 3000 competitors from 60 different countries to take an oath at the opening ceremony of the 11th World Taekwon-do festival and 15 ITF Taekwon-do World Championships. Another privilege for me was to be the participant of first historic taekwon-do Seminar with Grand Master Choi Jung Hwa IX, and many Masters such as Nestor Galaraga, Jose Maidana, Rudolf Kang, Don Dalton, Muleta, Kruk, Ligaj and others, which was held in the World Taekwondo Educational Center built and situated in Chung Cheong University. And together with all of them and many participants to visit the ancient shrine on the mountains and feel the breath of the history of taekwon-do through another dimension that you do not have the opportunity to feel and experience outside of Korea. To get to the presidential suite at 20th floor of Ramada, at the invitation of the President of ITF Grand Master Choi Jung Hwa himself and to spend time in conversation with him and his closest associates and to receive the gifts of memory is an unforgettable privilege for me and our world champion. The duty of every loyal member of the ITF is, if the higher force doesn''t stop you, was to come to Korea for this event because it was not the usual World Cup, which happens every two years, but it was a historic world championship which opened the door for ITF in South Korea which is the birth place of Grand Master Choi Jung Hwa, and a big step in rapprochement of the two federations WTF and ITF, mostly due to friendship of Mr. President Choi and Oskar Oh. As the only representative from the Croatian INO (INO # 366). I had the honor of participating on the World Congress ITF in which they made many important decisions and conclusions. We were witnesses of the promotion of two prominent VIII DAN Masters (Master Troiano and Master Creedon) which is a rare opportunity. Therefore, it was the duty of every one of us to come, participate and contribute to greater strength and reputation of the ITF organization which we belong to. To be participant in this historic event and a to incorporate themselves into the great moment of history and future of taekwon-do were my dreames, privileges and duties that have been realized. By returning home, this dream continues to live on transformed into the realization of departure and participation at the next European Championship in Ireland 2011th and the World Championships in Ottawa 2012th, the European Championships in Barcelona 2013th or the World Championships in Sardinia 2014th.Who knows, maybe again, and at festivals in Korea. In the end would like to thank all participants of the World Championship on beautiful moments and to congratulate to all of medal takers. Dominik Maduna IV. Chairman of ITF Taekwon-do Academy "Semper Fidelis" Croatia. Two different Sportaccord recognised federations work together in Austria. Is this hidden model used also in Serbia, Croatia and Slovenia? And probably they don't ask for cooperation with savate sport.